Time to Fire Up The Grill? When the weather gets hot, it makes me start thinking about grilling. Which is kind of weird because I don't have a patio in my third-floor apartment, so I can't really do any outdoor grilling. But it must be the guy gene because I just love the idea of grilling. And with May about here, I decided to share this recipe I have for a simple, light Vietnamese-inspired lamb. I love lamb, and this tangy savory marinade just makes it even more fun. 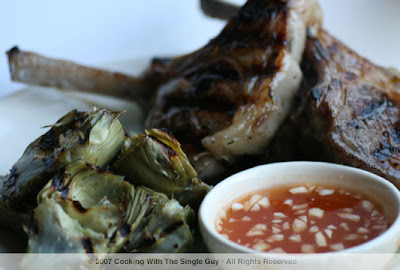 Serving it with grilled artichokes makes it a meal. Enjoy! Combine fish sauce, sugar, shallots, chili, lime juice and oil together in a bowl and blend well. Place marinade and lamb chops into an air-tight plastic bag and refrigerate for at least 1 hour. When ready to cook, place lamb on hot grill or grill pan, and cook about 2 minutes on each side. Serve with Vietnamese dipping sauce. Prepare the artichokes by cutting about a half an inch from the top and remove the stem. Remove the rough outer leaves. Place artichokes in a steamer and cook for about 20 minutes. When done, cut in half. Pat dry with a papercloth. Then drizzle with extra virgin olive oil and season with sea salt and pepper. Grill cut side down for about 1 minute. Combine all the ingredients together in a small bowl and whisk until well blended. Makes 1 serving. Serve with steamed “broken” rice. Pair with a glass of Cote du Rhone. TIP: “Broken” rice is pretty much what it sounds like: white rice that’s been broken during the milling process. This generally means that broken rice isn’t considered a premium rice and is actually used sometimes to feed ducks and other poultry. So now you’re wondering how appetizing this can be? For me, the broken rice just adds another texture to a meal. You can substitute with regular jasmine rice. It's strawberry season and these ruby colored beauties are probably one of the most popular berries around. So yesterday morning I took a nice walk in the morning heat (yes, it was hot in the Bay Area, but just on Saturday, not Sunday when the fog returned) down to my bakery in the 'hood, Bakesale Betty. This popular bakery in the Temescal neighborhood in Oakland has limited products, but always reflecting the season. So of course, they've brought back their strawberry shortcake ($4.50). 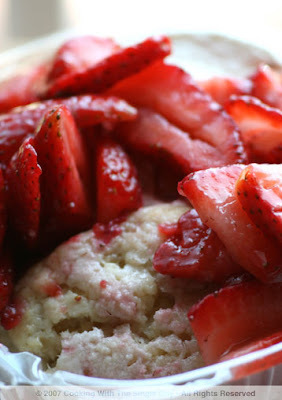 Their shortcake is a dense cake similar to their scones, then lathered with fresh strawberries in natural juices with a generous scoop of cream. I have to say, it still feels like it's early in the season because the strawberries weren't super sweet. But that's the picky eater in me. It's still a luscious afternoon treat. 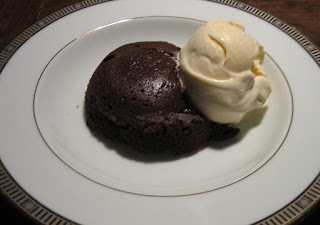 Because I don’t bake chocolate often (despite what you might recall about my brownies, hunt for chocolate drinks, or premium chocolates — geez, I guess I do blog a lot about chocolate for a vanilla lover), I thought I’d share Maureen’s simple recipe. She got the recipe from her husband’s stepmom, and it looks like she got it from a cookbook called Classic Home Desserts: A Treasury of Heirloom and Contemporary Recipes From Around The World. This recipe is credited to Thomas Keller, the celebrated Napa Valley chef and owner of French Laundry, who calls it a tart even though it doesn’t have a crust. You’ll see in the photo that she served the cake with a scoop of vanilla ice cream, but she says “I think it might be delish with raspberries or a sharp sorbet, but I didn’t have access to fresh berries nor good sorbet.” Finally, she says it’s important not to over bake it. Looks elegant and yummy. I may end up making it despite what I say about my lack of a chocolate gene. Thanks for sharing Maureen! 1. Lightly butter six 1 –cup ramekins or custard cups; set aside. 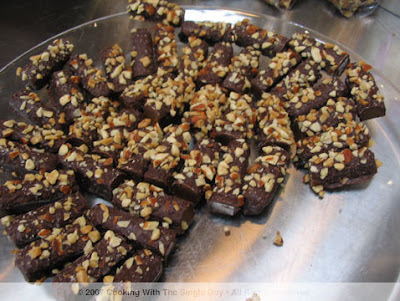 Place the semisweet and unsweetened chocolate in the top of a double boiler or in a bowl set over a saucepan of hot water over low heat (the bottom of the bowl should not touch the water). Stir occasionally until the chocolate melts; remove from the heat. 2. When the chocolate is smooth, stir in the butter and sugar until smooth. Add the eggs, flour, baking powder and cocoa. Beat with an electric mixer at medium-high speed until the mixture is pale and has a thick, mousse-like consistency; about 5 minutes. 4. Just before serving time, preheat the oven to 375 degrees with a rack at the center. Bake the cold desserts until the outer edges of the tops are set, but the centers are still moist and shiny, usually 10 to 11 minutes. Invert each portion onto a serving plate and serve warm, with a small scoop of the vanilla ice cream or a spoonful of vanilla-flavored whipped cream. Alternatively, serve directly from the ramekins. UPDATE: (03/04/08) This restaurant closed temporarily a few months ago but today announced that it will close for good. Tonight was Dining Out For Life, and since I had blogged about it and encouraged everyone to eat out during this special evening, I thought I had to be the man of my words and do the same. So I called my friend David and we made plans to go to one of the participating restaurants. We selected the 19-month-old Scott Howard in the Financial District/North Beach area. Scott Howard, simply enough, is named after the chef/owner Scott Howard, a French-influenced chef who got his start with Fork in Marin County. When his San Francisco restaurant opened, it had a high-end feel and the prices supposedly reflected that with a prix fixe menu that few ventured into. But somehow Howard recognized this pattern wasn't going to fly so he simplified his California-French offerings and got rid of the pricey prix fixe choices. Now that he's been able to build a nice buzz and customer base, he's brought back the prix fixe, albeit at a more reasonable $32. I personally am always intrigued by prix fixe menus. In many occasions, it's an affordable way to sample the talents of the kitchen without breaking your wallet. And, of course, on other occasions it's a sad way for a restaurant to move quickly some otherwise slow-moving dishes. The test for me is seeing whether I'll stick with the prix fixe choices or start to modify with additional appetizers and sides, thereby busting the fixed price. David and I decided to see whether Scott Howard's prix fixe menu was worth bringing back. For the prix fixe's first course, you have a choice of either a soup, salad, or appetizer. The choices tonight were the restaurant's specialty soup, the carrot broth with chervil sabayon and truffle oil, or a mache and frisee salad with green apple or smoked salmon on a crispy potato cake with a small arugula salad. I chose the carrot broth because it was the restaurant's specialty, and David got the smoked salmon. My soup was bright orange and tasty, but a bit too savory and sweet. 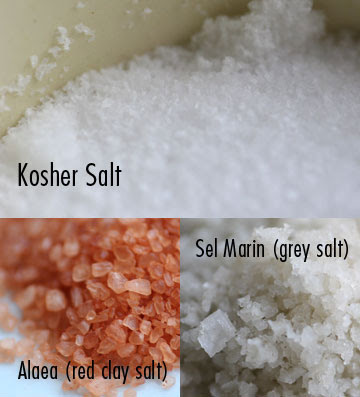 (It suffered from what is often labeled as the "over-salting" of restaurant food, IMHO.) David's smoke salmon was a delicate meal. The smoked salmon was subtle but fulfilling, and the potato cake was perfectly crisped and nicely paired with the lightly dressed small salad. The second course was the entree. 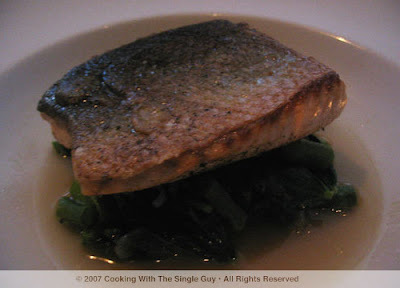 The choices were a salmon with asparagus or a lamb loin with braised greens and truffled jus. I went with the salmon while David got the lamb. My salmon came with a slight hint of fishiness. This is where I started a discussion with David about how a clear sign of freshness of a restaurant's seafood can be determined by whether you can smell the fish before it hits your table. David says he couldn't smell my salmon and deemed me too critical. Ha! He did agree with me that my salmon was average. I should add that the sauce tasted simply of asparagus water and nothing else. David's lamb, on the other hand, was a clear winner with its perfectly cooked redness and tenderness and the accompanying greens. (Unfortunately, my camera was running low on batteries so I couldn't take a picture of every dish and my attempt to photograph David's lamb resulted in a black blur.) But really, lamb is so easy to cook it's hard to go wrong with that choice on any menu. For our third and final course, the prix fixe offered a dessert of warm chocolate cake or butterscotch pudding. 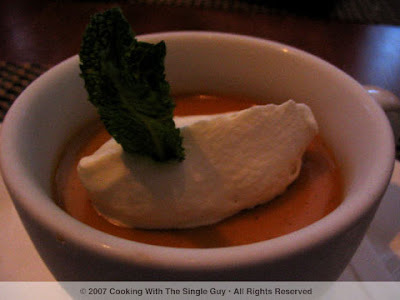 David and I didn't differ on this front: We both ordered the butterscotch pudding. With the first bite, I declared myself happy after what I was convinced was my poor choices in the prix fixe menu. The pudding was luscious, with a deep wonderful amber color off-set by the cream topping. It tasted like tapioca, but without the weird jelly pearls. It was a rich, tasty treat and I loved it. David didn't have the same reaction as me, but I think he secretly loved it. In the end, I decided that David had my perfect dinner, with the crispy potato cake and smoked salmon and wonderful lamb finished with delectable butterscotch pudding (a dessert I've never seen at any other restaurant). My dinner was hit and miss and was only saved by the dessert. Minor note: Our server was not my favorite. I generally write off one inefficient server as a misnomer and don't add the service into my ratings, but I have to point out that this particular guy was incomplete in our service (not asking us if we wanted coffee or tea with our dessert or taking David's wine order but not mines) and a bit rushed. It didn't add to my enjoyment. Also, we got a drink at the bar before dinner and the bartender didn't even know what a glass of cava was when I asked if she had any. (Cava is the Spanish sparkling wine.) Again, a few holes in the overall experience at Scott Howard. 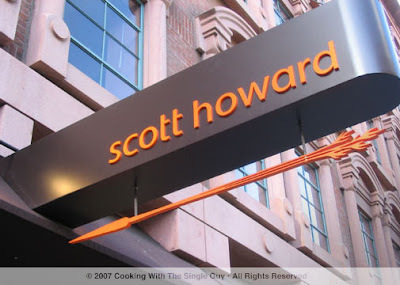 Scott Howard is an elegant restaurant with rich dark decor and a stylish setting. The menu, outside of the prix fixe, looks enticing and I probably would come back to order off of it. (The menu changes daily, although some regular favorites like the carrot broth soup and short ribs are probably always on the menu.) 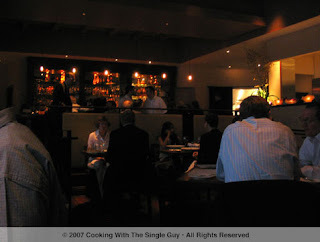 I agree with David that the prix fixe menu is a nice value compared to other restaurants. But because of the inconsistency in some of the execution of the dishes, I was left wanting a little bit more. More freshness. More innovation. More satisfaction. One of the nice touches of Scott Howard is that at the end of the night when they bring the bill, it's contained in a slip that includes a recipe printed inside. I thought that was such a fun idea, and I'm gladly sharing the recipe printed in our slip tonight. It was for the house special carrot broth. Enjoy! 1. Put diced carrots in a small pot. 2. Cover with carrot juice (reserve remaining for later). 3. Cook carrots in juice until the juice is reduced until dry. 4. In blender, puree cooked carrots (in small batches) with remaining juice until smooth. 5. Return to stove. Slowly heat to a simmer. 6. Add curry powder and then salt and pepper to taste. 8. Strain through Chinoise (fine mesh strainer). 9. Garnish with cream fraiche and truffle oil. I love duck, but I've mentioned before that I've never prepared it at home because of what I imagine is the smoky mess. (One day, though, I'm going to face my fear. But not today. A day when Idol Gives Back. Sorry, random reference.) 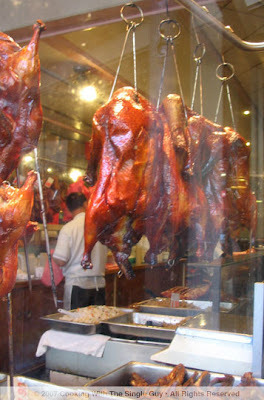 Anywho, so what I usually do to quell my love for duck--other than to order it whenever I see it on a restaurant menu--is to head down to Chinatown and buy one of these scrumptious roasted ducks hanging in the window of various roasting shops. I typically tell the guy at the window to give me just half a duck (averages about $6 to $7 for half) and he chops it into slices for me. When I get home, I either eat it as is with some sauteed vegetables, or I create something special like the duck risotto below. (Then with my duck bones, I put them in the freezer for a later time when I can make my jook.) Enjoy! In a medium saucepan, warm 2 tablespoon of olive oil over medium high heat and add onion. Cook for about two minutes until translucent, making sure not to brown the onions. Add rice and stir with onions, letting the heat toast the rice for about a minute. Turn heat to medium and add wine and cook until most of it evaporates. Add broth, about 1 cup, and continue cooking for about 15 to 20 minutes, adding 1/2 cup of broth at a time along the way, until rice is al dente, or almost done. Remove saucepan from the fire and stir in butter and cheese. 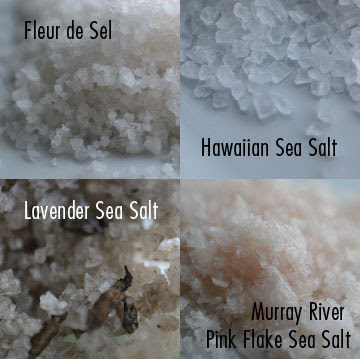 Add salt to your taste. Let it sit for about a minute, then plate up your risotto. Garnish with more parmesan. Pair with a Pinot Noir. TIP: For this recipe, I buy my roasted duck already made from the butcher stands in Chinatown. If you don’t have a favorite spot to buy cooked duck, then you can buy duck breast and pan sear them with salt, pepper and Chinese 5-spice and then finish off in the oven at 375 degrees for about 20 to 30 minutes. 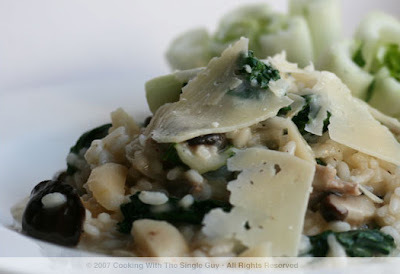 When done, cut into slices and fan over the top of your plate of risotto. CHOICES: Risotto rice makes this dish unique with its short grain and creamy texture. So you can’t substitute it with the typical long-grain rice or even Japanese sushi rice. But you do have choices. There are three main Italian rice to make risotto: Arborio, Carnaroli and Vialone Nano. Arborio is the one most widely available outside of Italy and can be easily found in any grocery store. It consistently cooks in 15 minutes and produces a nice cream. But don’t be afraid to experiment with Carnaroli and Vialone Nano if you spot them on a gourm et store shelf. They both cook a bit longer, but Carnaroli grains keep more of their shape so it’s a nice choice if you don’t like your risotto too mushy. Vialone Nano is creamier if you want to go the other direction. As fair play, I decided to make a visit to the Oakland Coliseum—home of the Athletics (or A’s). Of course, I did it during the awful showing of my Yankees when they were in town. Sigh. This is turning out to be a long baseball summer for The Single Guy Chef. The vibe is dramatically different at McAfee Coliseum (yes, this ballpark changes its name often too) from AT&T Park where the San Francisco Giants play. At AT&T, it’s all about fun, fancy foods and pretty bay views. In Oakland, it’s all about baseball. Here, a hot dog is a hot dog. There’s no Niman Ranch. And there’s definitely no sushi. 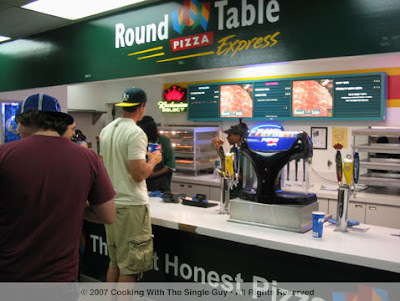 So here’s my tour of the baseball eats at the Coliseum. 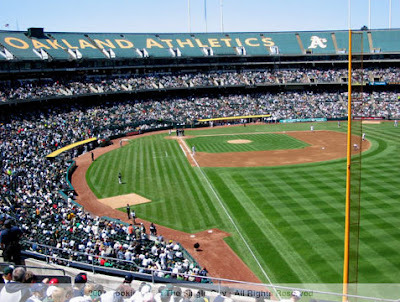 Thankfully the Yankees aren’t playing the A’s on their turf for the rest of the season. The Coliseum actually has a spot that provides what comes close to a restaurant feel. The Westside Club on the upper level provides luxury box-like seating where you can order from a menu and watch the game. 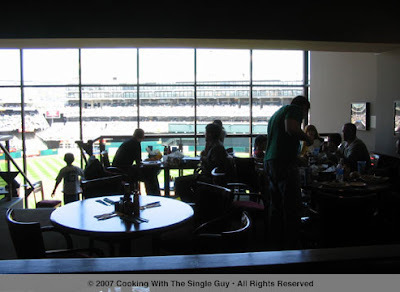 Unlike other ballparks’ club rooms, this club is open to anyone with a ticket. You have to check in with a hostess and get seated, though, and there may be a wait. The menu offers a full range of soup, salads, sandwiches and other typical baseball munchies. 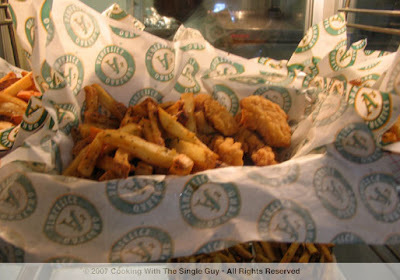 Here’s how garlic fries look on the other side of the bay. You buy them from the Gordon Biersch stand. The tray looks a bit smaller than what you get in San Francisco, but it’s $1 cheaper in Oakland. Again, me no like fried food. So I didn’t do a comparison test. I searched and searched for something unusual to try out for my lunch. That’s when I realized that at the Coliseum, there’s no fancy food like a Crazy Crab sandwich or a Cha Cha Bowl. So instead I settled for a Philly cheese steak sandwich ($7.50). As you can see from the picture, it was a real mess when I removed the wrapper, and it didn’t look that appetizing. But surprisingly, it tasted pretty good and the meat was thinly sliced making it easy to chew. So what if the cheese wasn’t gruyere (I’m sure it was some kind of processed American cheese), it sure felt comforting. My favorite go-to meal at AT&T Park is the individual pizza. In Oakland, they get theirs straight from Round Table. Nuff said. Of course, there were tons of beer stands. This particular one had a Hawaiian theme. 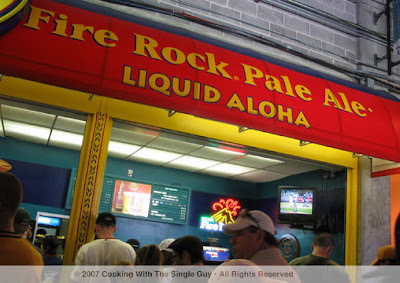 I thought it was funny that they were selling “liquid Aloha.” Hmmm, growing up in Hawaii I think they called that a mai tai. Fried food everywhere! Here’s a picture of the fish and chips for sale. Any guesses on whether I tried it? I think not. The one thing I have to say about the Coliseum’s food offerings is that the prices don’t border on price-gouging as it can often happen at AT&T Park. Most of the food items in Oakland range between $6 and $7 (other than the Westside Club where prices are slightly higher because you have seating). But one place where the prices were a bit high (nearing $11) was this barbeque joint on the third base end of the ballpark. 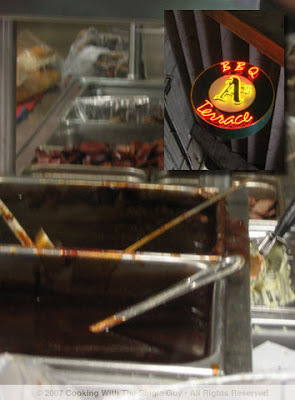 You can get a variety of barbeque items like rib dinners and pork sandwiches. There was a line despite the prices. 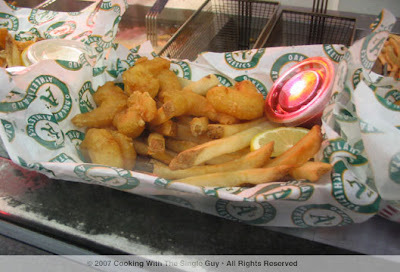 Despite all my ramblings about fried food, it’s nice to know that at most ballparks, including AT&T in San Francisco and the Coliseum, items are fried without trans fat—that ugly man-made fat that has been linked to various diseases. 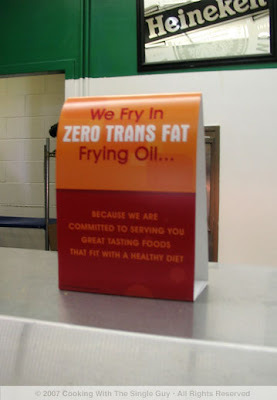 Still, some kind of fat is being used. Which is why I’m off looking for a burrito. Having a blog is like having a diary. You end up sharing a bit about yourself. What have you learned so far about me? I love lavender and I don't eat deep-fried food. I drink tea but not coffee. And I don't own a car. Now another thing about me: Last year my doctor said I have high cholesterol (which is crazy when I weigh only about 140 pounds and hardly eat butter). Because I exercise regularly, my doctor is letting me give it a try to reduce my cholesterol through diet instead of medication. What does this all have to do with that big lovely bread above? Well, my nutritional program recommends me eating more whole cereals and grains, such as bread, for the fiber. 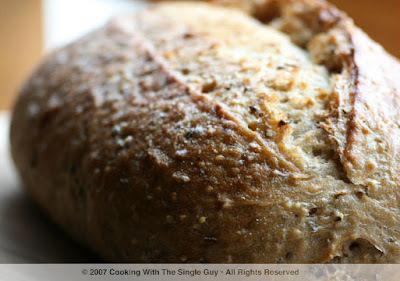 So over the past few months I've been looking for a good-tasting whole grain bread. My current favorite is this whole grain bread from La Brea Bakery. What's amazing about this bread is that you get it fresh even though the bakery is down in Southern California. That's because La Brea has created this process where they half-bake their breads and then ship them across the country. When they arrive at the destination cities, they're baked to full glory and sold piping hot at your local stores. I get mines from Whole Foods, but it's also available at Trader Joe's, Andronico's, Mollie Stones and Costco. (I also saw on its Web site that they're now available in Hawaii at Foodland, so now I know where to go for bread when I visit my family on vacation.) I'm still testing out various whole grain artisan breads from local bakeries, but so far La Brea's whole grain is leading the pack. Remember that purple cauliflower I saw last weekend? I became so obsessed about it that I spent the better part of last week looking for it again. I had read online that purple cauliflower is natural and wild, and not a hybrid, which made me think it has a short season. I kept thinking I may not see it at the stores for very much longer. Thus, the obsession began. At Whole Foods, there were just a few left (I guess other people were intrigued by the color or became just as obsessed as I) and I grabbed one. It didn’t seem as fresh, almost like they were the same ones I saw from the previous weekend. But no matter. Cauliflower is a hearty bunch. I’ve come to learn that purple cauliflower is really healthy for you—filled with lots of antioxidants, which explains the deep purple color. As you know, it’s healthy for you to eat deep-colored vegetables. And the more colors the better (don’t just stick with dark green). But I also learned that purple cauliflower, while more tender than the regular white ones, has less flavor. And the color fades as it’s cooked. 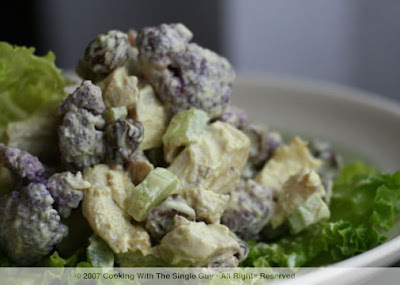 Next time you see purple cauliflower at the store, pick it up and try this recipe. Or beware of the sleepless nights of obsession. Season your chicken breast with sea salt and pepper and coat with olive oil. Place on roasting pan and bake in oven for about 25-30 minutes, depending on the thickness. When done, remove from oven and let cool. Then chop into cubes. Bring a pot of water to boil. 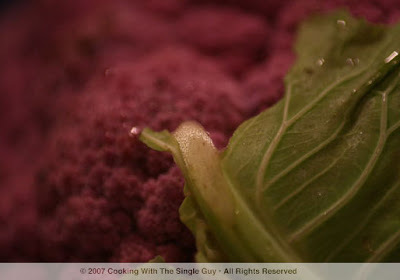 Then quickly blanch your cauliflower (about 30 seconds) and then immediately place in a bowl of cold water with either a drop of vinegar or lemon juice to help retain the purple color. When ready to prepare your salad, drain the water and let the cauliflower air dry in colander. In a small bowl, mix mayonnaise, curry powder and vinegar. Add a pinch of salt and pepper. Then combine all your ingredients in a big bowl: chicken, cauliflower, celery, raisin and mayonnaise mixture. Blend well, and then refrigerate. Serve as sandwiches or on a bed of butter lettuce as a salad. Pair with a glass of Gewurtraminer. TIP: If you don’t have champagne vinegar, replace with any light tasting white vinegar such as rice wine vinegar. EVERYTHING’S PURPLE: The purple cauliflower is more tender than regular white cauliflower so you don’t need to blanch it that long. The longer you cook it in the boiling water, the more grey the color. (The purple color will fade as it cooks.) To also help prevent the color from fading, keeping the cauliflower in water with lemon juice or vinegar will help. Happy Earth Day everyone! (And it turned out to be a nice sunny earth day in the Bay Area after some overnight showers.) I'm a big believer of caring for our planet, which is why I have the banner from Stopglobalwarming.org on my site. I try to do everything I can to help the Earth, and--bringing this all back to food--one of the best things you can do to help the planet is by shopping at your local farmers market. Shopping locally not only supports people who live in your community (or nearby) but it means less energy is used to ship the produce to you. And when you buy organic produce, which you can find often at farmers markets, that means less chemicals are being used in the soil and contaminating the ground. 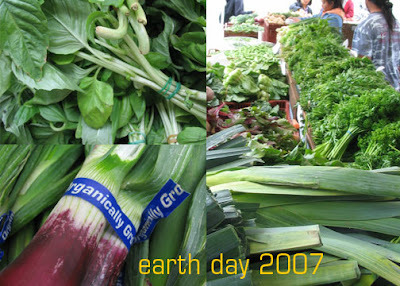 I just came back from shopping at my farmers market in the Temescal neighborhood in Oakland. (I bought some cauliflower and leeks to make my cauliflower soup, and some fresh bread.) What's nice is that it's just a 10-minute walk from my home, so I didn't have to drive (not that I would since I don't own a car). So get out and visit a farmers market today, or next weekend. And be nice to our planet. It's your home, too. Here's a nice comprehensive list of Bay Area farmers markets from SFGate. Have you noticed how sweet the navel oranges have been at the stores lately? I was surprised to taste the sweetness because I thought the season was almost over for citrus, as we start seeing spring fruits like strawberries. But I guess after the freeze earlier this year, the oranges are making up for it with a last burst of sweetness. The sweet oranges inspired me to make a souffle recipe I read in my PlumpJack Cookbook. As usual, I played with the recipe to reduce the servings. (The recipe in the book calls for 10 egg whites(!) to make 6 souffles.) As a single guy, I don't need to make that many souffles, especially since they don't really keep well. (It always tastes best fresh from the oven and puffed up.) I added my own twist to the recipe by throwing in a pinch of saffron threads to add to the color (that's the red things you see in the sauce above--please, no sperm jokes!). How did it turn out? Well, you can see below that the souffle looked really beautiful. But I thought it was a bit eggy for my taste. Who knows, maybe you might like that. Souffles are typically very sensitive too. I made three servings, and one of it fell before I could serve it. So it is true that you have to tip-toe when working around souffles. Nothing's more unappetizing than a flat souffle. Enjoy! 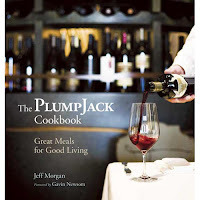 The following recipe is adapted from The PlumpJack Cookbook and copyright belongs to Jeff Morgan and Rodale Books. Preheat oven to 375 degrees. Butter 3 6-oz. ramekins and dust with granulated sugar. Cut the rind and pith from the oranges. Halve the oranges across the equator and take out any seeds, then cut into chunks and put them in a blender or food processor. Pulse until they're reduced to a smooth puree. 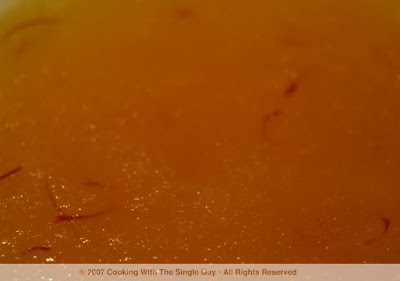 Pour the puree into a small saucepan, stir in the sugar and saffron and bring to a boil over medium heat, stirring occasionally to avoid sticking. In a cup or small bowl, mix the cornstarch and water to create a slurry. Stir the cornstarch mixture into the orange-sugar mixture over high heat. When it begins to boil, reduce the heat and simmer for 5 minutes. Transfer to a nonreactive bowl and let cool to room temperature. Place the eggs whites and cream of tartar in a large bowl. Using an electric mixer, whip the egg whites at high speed until stiff peaks form. Gently fold in the orange mixture with a wooden spoon or rubber spatula until blended (but don't stir too much to avoid losing the air in the egg whites). 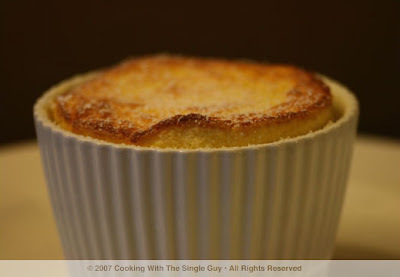 Fill each ramekin to the top with the souffle mixture and smooth flat with a spatula. Place the ramekins on a baking sheet and set them on the top rack in the oven. Bake for 10 to 15 minutes until the souffles have risen about 1/2 inch above the ramekins and are golden brown on top. Remove from oven and dust with confectioners' sugar. Serve immediately. Pair with a dessert wine like Muscat. Chow’s success has allowed restaurateur Tony Gulisano to open equally popular restaurants near the Golden Gate Park (Park Chow) and a location in Lafayette in the East Bay. Recently, I wanted to see if the original Chow still had its charm. 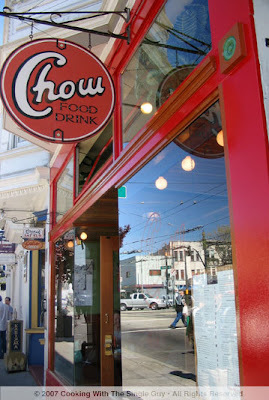 It’s funny that I sometimes see Chow referred to as a popular gay spot, just because it’s on the way to the Castro. Sure, you’ll see a lot of gay men eating there. 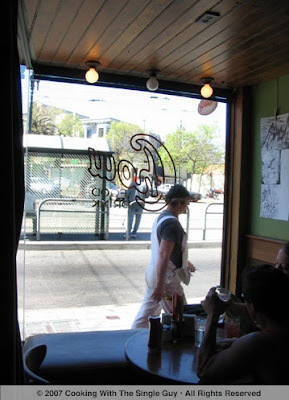 (But is that really a surprise to see gay men eating out in San Francisco?) Or maybe it’s because Chow is right next door to a gay bar (the Pilsner Inn, which often serves as a waiting area for people waiting for a table at Chow). But whenever I’ve visited there, I’ve always found a mixed crowd who are just hungry to chow down on Chow’s eclectic menu. The Bohemian vibe of the Church Street location is reflected in the mix of food on the menu, from salads to diner classics to attempts at Pan-Asian cuisine like Thai noodles. On this visit, my lunch partner and I sat out in the patio area in the back. And yes, we were sitting next to a gay couple. I started with the mussels, which were simply steamed with white wine, butter, onion and parsley. It was a huge starter, which is the signature of Chow: hearty food at reasonable prices. This is why people keep coming back over the years. 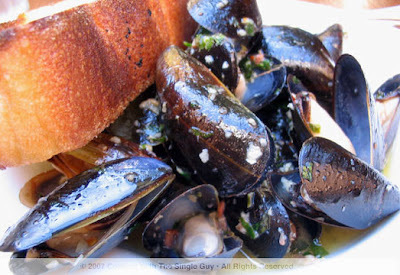 Along with the large bowl of mussels was a big honking piece of garlic bread (well, the bread wasn’t actually making a honking noise, but you get my drift), which I heartily used to slurp up the juices of the mussels from my bowl. 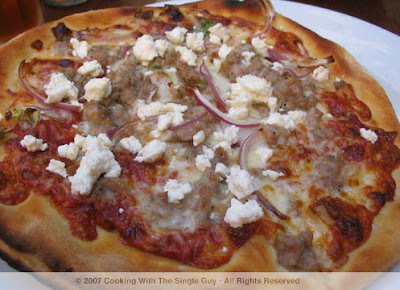 For lunch I had the sausage pizza with goat cheese and red onions. It was the small individual size, and it was warm and satisfying—nothing spectacular but definitely filling. My lunch partner ordered the beef short ribs that were pure comfort food, from the fork-tender meat to the bed of mashed potatoes. I tasted a bit of it and found it slightly bland. Around our table, I watched as people ordered huge salads that came piled up on plates. Other than the mussels, there weren’t that many memorable things about our lunch. But the food was fresh and you sure got a lot of it. For that, Chow is a nice fall back when you can’t decide which fancy new restaurant to try. You can always count on Chow to make sure you never go hungry in the city. Back to some cooking. Today I’m cooking with a clay pot. I’ve been wanting to do this since my trip to Vietnam in January where many of their dishes are presented in beautiful clay pots. One of my favorite dish I ate was called Ca Kho To, or Caramel Fish. The claypots in Vietnam are actually more beautiful than what you can find in the Asian stores in the United States. The Vietnamese pots are often darker, almost like iron. In Chinatown, you can get decorative glazed Japanese claypots or the commonly found ones (pictured above) that are porous with a glazed interior and cover. My mom bought me a decorative Japanese version a year ago but I misused it and it cracked. So not wanting to crack another expensive one, I’m starting out with the cheaper, plain clay versions. I bought the above for $3 in San Francisco’s Chinatown. So you probably can guess that claypots are fragile for cooking. But it provides an even heat source and it’s so pretty you can place the pot right on your table and start eating. 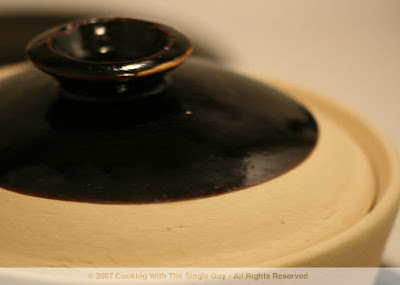 1) After you buy your claypot, soak it in water overnight before you use it the first time. 3) Never cook your claypot over high heat. 4) If you haven’t used your claypot for awhile, soak it again for a few hours. This is especially true if you live in dry arid places or during the winter when there’s not much moisture in the air. Feel confident now about cooking with a claypot? Then try the recipe below. Enjoy! * Look for chicken broth in powder form instead of boullions. Start by making the caramel syrup. In a small stainless steel saucepan (do not use a non-stick pan), melt 3 tablespoon of sugar over high heat. Stir to make sure it doesn’t burn. The sugar will melt and turn to an amber brown liquid before turning to almost a reddish coffee brown color. This is when you take it off the heat. Add a tablespoon of hot water. Sugar will bubble briefly and may splatter. Place pot back on burner if you need to melt any sugar that hardened. Set aside to let cool. 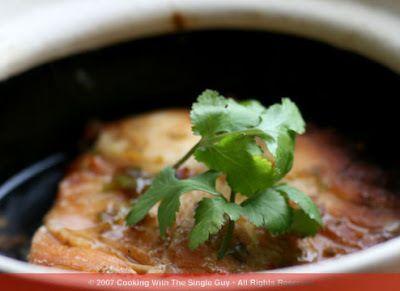 When you’re ready to cook your fish, place your claypot on your burner and slowly bring it to a medium heat. Add your caramel sauce to cook with the fish. After about 2 minutes, flip your fish to cook the other side. Add a squeeze of lime juice. Continue cooking for about 10 minutes (depending on the thickness of your fish steak) until the sauce reduces to a slightly thick consistency. Garnish with cilantro (or chopped spring onions). Makes one serving. 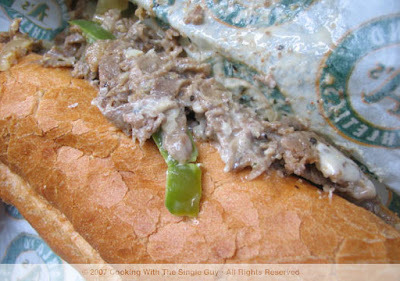 Serve with steamed rice and sauteed vegetables such as asparagus or snow peas. TIP: It makes a nicer presentation if you remove the bones and skin of the fish before serving. The fish will be so flakey from the cooking that you can easily just remove the skin and main piece of bone with a fork. Then just coat the fish pieces with some of the sauce and serve it straight in the claypot. THE WONDERS OF THE CLAYPOT: I’ve found the claypot such a beautiful instrument in the kitchen but quite tempermental. So to make sure it doesn’t crack from the heat when cooking, soak it for a few hours the night before you use it. Also, don’t expose it to extreme heat such as if it’s a cold day and you place it directly on a high heat. Gradually warm your claypot and never cook with the heat on high. It is not a wok. 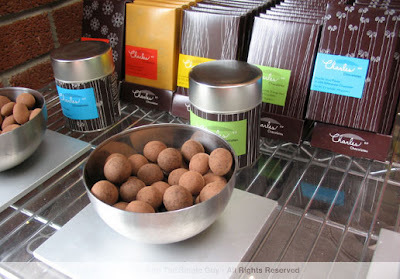 I’m finally getting around to blogging about my visit to Charles Chocolates’ fairly new retail store in Emeryville. I know, I thought the same thing. Emeryville? Home of Pixar and Kodak Gallery (formerly known as Ofoto)? After my urban hike to find the store (I caught a bus to the Emeryville Public Market and then had to walk a few blocks across the railroad tracks to Hollis Street), I found that Charles Chocolates wasn’t surrounded by much other than a new Starbucks at the corner and a lot of new condo lofts. I hope the people who live in these condos eat chocolates often because I don’t think the location of the retail store will garner much foot traffic. 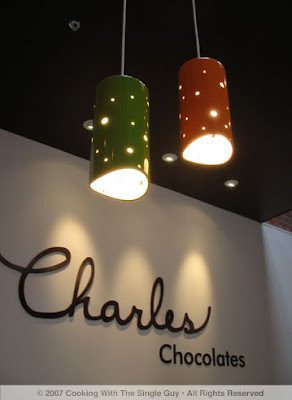 Charles Chocolates is the brainchild of Charles (Chuck) Siegel, who started his love for chocolates with Attivo Confections. 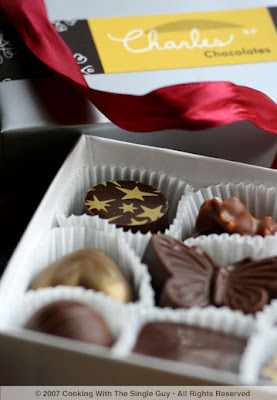 His whole thing is hand-made chocolates with no artificial ingredients or preservatives. (In fact, all the boxes have an “eat by” date.) For most people familiar with Charles Chocolates, you’ve probably seen the bars sold at Whole Foods Market. 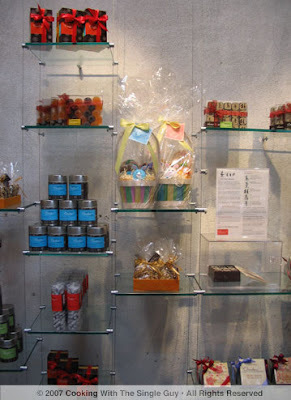 For the rest of their hand-made chocolate products, they were mostly available only online and just recently at Cocoa Bella at the San Francisco Westfield Centre. The store has a whimsical, fresh feel to it. It’s not very big, but (at least for now) they’re very generous with the samplings. A long talked about café was supposed to open this month with a view of the chocolate factory, but when I visited the space, the café looked like it may be another two to three months before it opens. 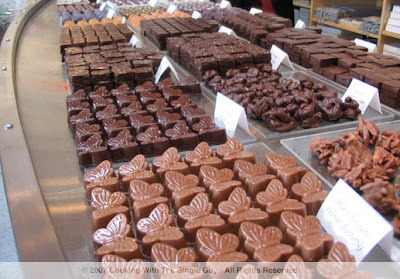 On two walls on opposite ends of the tiny store, you’ll find a variety of chocolate products. When I was there, I saw several products that were co-branded with companies like Teance and Miette. Of course, they were beautifully wrapped. One of the cool products was an edible chocolate box. Talk about chocolate overload! More samples. This was a plate of chocolate with nuts, but I didn’t try it so I can’t tell you what it is. It’s not featured on the Web site either, so your guess is as good as mines. Chocolate powdered nuts and the widely available chocolate bars. One of the new chocolate nuts is a triple chocolate hazelnut. Mmmm. 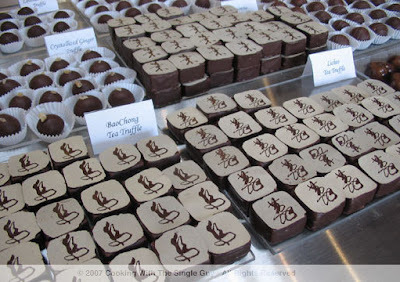 Many of the tea-infused chocolates come with these cool designs on top that looks almost like Chinese calligraphy. I have to say, I didn’t feel like the tea-infused chocolates had a distinctive tea taste. (And you know how much I love tea.) The chocolate did have a deeper, richer flavor, but I wasn’t able to taste any essence of a particular tea flavor like Earl Grey or the lychee I tried. Bittersweet Peanut Butterfly—Charles has two butterflies and this one has a nice rich flavor with a nutty praline taste. Made me feel like I was in the south for some reason. Raspberry Heart—Fresh raspberry ganache in a bittersweet gold heart. Pretty and tasty! The cream was smooth and sweet. It was a sublime experience. Caramelized Almond Cluster—This can be very addictive. I think it's the strong nutty flavor. It's actual more a almond cluster coated with chocolate than really a chocolate candy. Whatever the dual identity, I could eat this with a movie. PH: 510.652.4412; open daily, 11 a.m. to 7 p.m.
Last night I had a wonderful evening as a dinner guest at the San Jose home of my friend Jessie. (He's the same one I went to Foreign Cinema with.) I love the idea of dinner parties, but because I live in a studio apartment, I rarely play the host. So it's always nice when I can play the guest instead. Jessie throws the most seductive parties. I say this because his food is always luxurious and it's accented with perfect ambient lighting at his charming home. But I rarely get to go to Jessie's for dinner because I don't own a car and BART doesn't go all the way to San Jose from the East Bay. Which is why this was a rare treat and I wanted to photograph it. Jessie was a good sport about it. 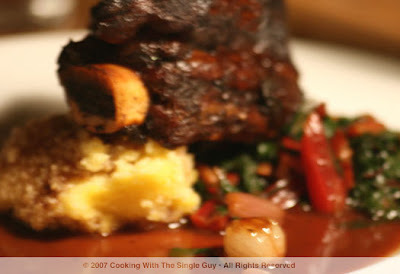 The focus of his dinner was this slow cooked short rib, which he made using a recipe he read in the New York Times. (By the way, this dinner includes several New York connections, so just a warning to those of you who gets turned off with all the New York references.) The recipe was adapted by "Sunday Suppers at Lucques" by Suzanne Gout and involves wine and port. Anything with that much alcohol has got to be good. 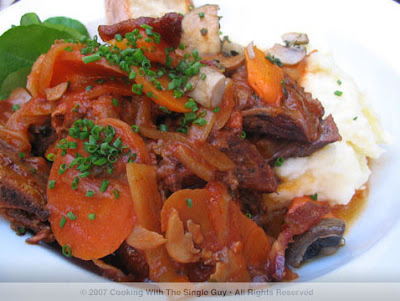 The main dish of short ribs is paired with roasted pearl onions. The recipe says to dress the onions in 2 tablespoon olive oil, 1 teaspoon thyme, 3/4 teaspoon salt and a pinch of pepper. Jessie roasted them in the oven at 425 degrees until tender. When they cool, he peeled off the skin and was left with the roasted tender pearls. Another complement to the meat is this horseradish sauce. The recipe calls for 3/4 cup creme fraiche mixed with 1 tablespoon of prepared horseradish. Jessie didn't feel like hunting down creme fraiche (it's not something you can just get at the local grocery store) so he substituted with sour cream. He added some pepper and blended it well. I love horseradish. Jessie's dinners always start with a nice cheese platter. 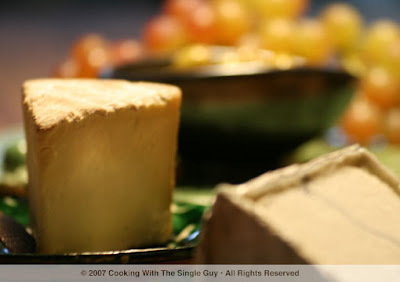 He had three types of cheese: one hard cheese (manchego), a goat cheese, and this French cheese that was soft as butter. One of our friends, Roger, who came with his wife, Denise, and two cute kids also contributed to the dinner with this lovely pea soup. Again, Roger got the recipe from The New York Times. Roger often looks to the Times for recipes because he used to work for the paper. Jessie knows Roger when Jessie lived in New York working for Newsday, which is also the same paper I worked for. (If you're keeping count, that's four mentions of New York. 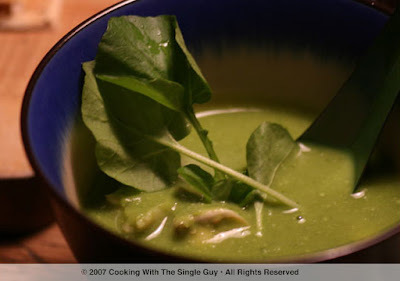 :) The soup was made with peas, bay scallops, oysters, watercress, and Pernod. It was so creamy and seductive. 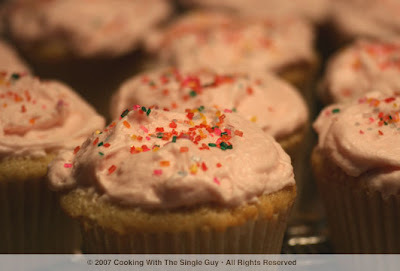 The cupcakes were vanilla with a butter cream frosting. It tasted so light and the frosting was so smooth, it was the perfect ending to a seductive supper. Thanks Jessie! 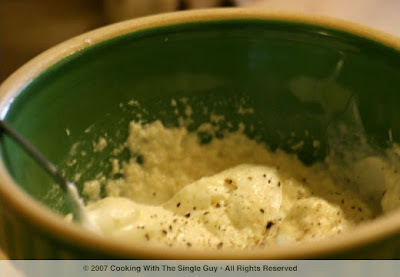 Make the horseradish cream sauce (per instructions above) and set aside. Preheat oven to 425 degrees. 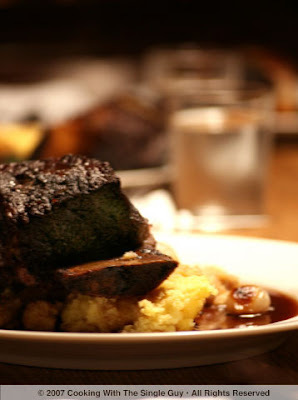 Take the short ribs out of the refrigerator. After 30 minutes, season them generously with salt. 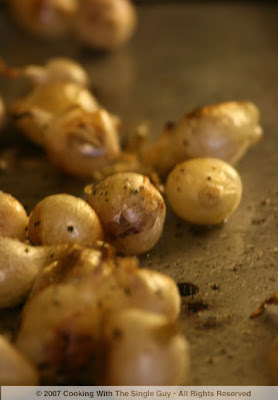 Cook the pearl onions per instructions above and when done, remove from oven and reduce heat to 325 degrees. Heat remaining olive oil in a large saute pan until almost smoking. Add the ribs and brown on all sides. Transfer to a braising pan, bone-side up, in one layer. Let the ribs rest for 10 minutes, then transfer them to a baking sheet. Turn up the oven to 400 degrees. Cook the ribs uncovered for 10 to 15 minutes to brown. Strain the broth into a saucepan and skim the fat. If the sauce seems thin, reduce it over medium high heat. Serve the ribs and juices on a bed of sauteed swiss chard and the pearl onions, with mashed potatoes (or polenta) and horseradish cream on the side.